UPDATE Tuesday, Dec. 2: We will be delivering the petition signatures to Cardinal Burke NEXT Tuesday (Dec. 9). This is your LAST chance to thank the cardinal, and to let him know that you are praying for him. Be sure to share the petition with your friends and family. On Nov. 8, the Vatican announced that Pope Francis had removed Cardinal Raymond Burke, one of the strongest pro-life and pro-family voices in the Catholic Church, from his position as the prefect of the Vatican’s Apostolic Signatura. 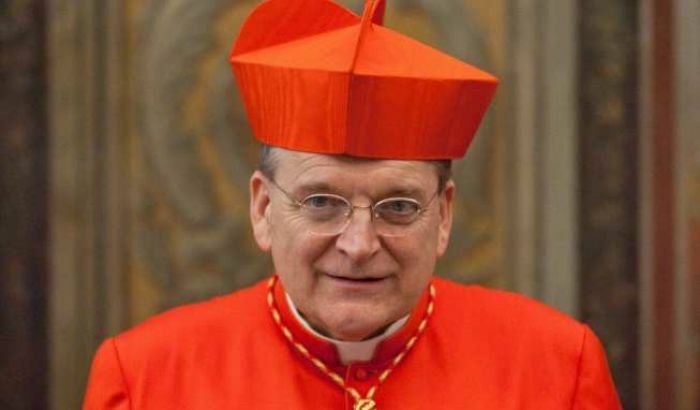 Cardinal Burke has instead been namedpatron of the Sovereign Military Order of Malta, a largely ceremonial role. For the past 6 years, Cardinal Burke has served at the Vatican, after he was called there by Pope Benedict, heading up the highest court of the Catholic Church. Among Cardinal Burke’s many actions in defense of the truths of life and family has been his courageous stance in support of canon 915, which states that ministers of communion “must” refuse the Eucharist to public and “obstinate” sinners. The cardinal himself has most frequently advocated the use of this canon in the cases of pro-abortion Catholic politicians. Most recently, he exerted his influence during the Vatican’s Synod on the Family, publicly decrying efforts by some bishops to hijack the synod to push a radical agenda, and steering the Synod towards a more orthodox conclusion. The transfer of Cardinal Burke from his Vatican post is undoubtedly a loss to the pro-life and pro-family movement, with his role at the Vatican having helped to amplify the cardinal’s prophetic voice. However, we are confident that the transfer will do little to silence the cardinal, and that we may look forward to years more of close collaboration with and support for the pro-life and pro-family movement. We offer this petition to give people an opportunity to express their personal thanks to the cardinal. The names and signatures on this petition will be personally hand-delivered to Cardinal Burke in Rome. I would like to express my personal gratitude for your faithful service these past years as prefect of the Apostolic Signatura. In particular, I wish to thank you for being a strong and uncompromising voice in defense of the truths of life and the family. Though I, and countless fellow Catholics and pro-life and pro-family advocates, will miss your voice and presence at the Vatican, I know that a transfer of position will do nothing to dissuade you from courageously proclaiming the truths of the Gospel of Life. You have inspired me to stand up for the truth in charity despite all costs. I pledge myself to be a voice like yours - a voice of truth in season and out of season. I offer you my heartfelt prayers and well wishes as you go through this period of transition. May God bless you.